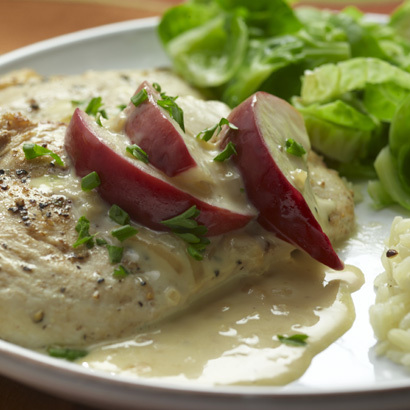 Sautéed chicken breasts with a lovely pan sauce—spiked by Calvados, the famous apple brandy of Normandy—is the centerpiece to this easy menu. It’s quick enough for a weeknight meal, but special enough to share with friends on the weekend. Enjoy! Chicken Calvados tastes opulent, but is actually a relatively inexpensive dish. Wine Pairing: The fruitiness of a Chenin Blanc from the Loire Valley will serve this well. If you like a drier style (and you’re feeling splashy), go for a Savennières, also made from Chenin Blanc, but mineraly and dry. • The sit-down first course is just a matter of shopping, then arranging the pâté or meats artfully on serving plates. So easy! • For the main course, get the rice going first; then, prep all your ingredients for the chicken. Remember that the rice will keep well in a warm place for 30 minutes to an hour, if you use a very heavy pan to cook it in. • Remember that cake freezes extraordinarily well, so you can make it well in advance if you wish.